Like the other Baritainer Jerry cans, the new 13 Liter, 3.5 gallon size is cost-effective, impact-resistant, stackable, lightweight, and recyclable. It is UN Classification Y Rated and replaces fluorinated and lined steel cans. Our Baritainer jerry cans are an innovative, safe and environmentally friendly packaging alternative that resists diffusion and evaporation preventing costly product loss. - Kevin Callahan, COO of Barrier Plastics. Barrier Plastics announces the release of its new 13-liter Baritainer® Jerry Can. Like the other Baritainer® Jerry cans, the new 13-liter size is cost-effective, impact-resistant, stackable, lightweight, and recyclable. It is UN Classification Y Rated and replaces fluorinated and lined steel cans. "The 13-liter Jerry Can expands our already impressive Baritainer® product line," commented Kevin J. Callahan, Chief Operating Officer of Barrier Plastics, Inc. "Available in blue, white, and natural color, it is FDA compliant and features an engineered bottom seam for added seal integrity." Measuring 11.1 by 10 inches with a height of 10.4 inches, the 13-liter (3.5-gallon) Baritainer® Jerry Can weighs 1.94 pounds (880 grams) and has a 3.6-gallon overflow and a 70-millimeter ratchet neck with six threads per inch. Its wall thickness is .030 to .033 inches. 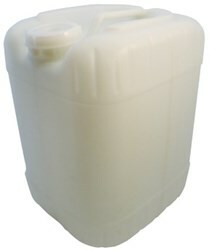 All Barrier Plastics Baritainer® Jerry Cans are made with Quoral® Barrier Resin (BR), manufactured by Barrier Plastics' sister company, BP Polymers. Quoral® BR is a unique and proprietary barrier resin additive for high-density polyethylene that utilizes laminate technology. Quoral®-based Jerry Cans can be used to safely transport solvent-based products such as household chemicals, industrial chemicals, cleaning solvents, adhesives, wood preservatives, automotive additives, and agricultural chemicals. They may also be used to safely transport foodstuffs such as flavorings and edible and essential oils. In other company news, Barrier Plastics has moved into its new corporate headquarters located in Irvine, CA. The telephone numbers remain the same. For more information on all of the Baritainer® Jerry Cans, along with the rest of Barrier Plastics' products, please visit http://www.barrierplastics.com or call (949) 380-1611. Barrier Plastics, Inc. was founded in 2008 after two years of extensive materials research and product development. Based in California, with domestic warehousing in Artesia and Newark, California, Barrier Plastics is the sole US manufacturer of Quoral® BR Baritainers®. The company is a proud member in good standing of the National Association of Manufacturers (NAM). Barrier Plastics' sister company, BP Polymers, LLC is located in Southern California.